I was already very holistic minded but at this time I had no idea about the power of essential oils. I was a big believer in herbs from the Naturopath and I was taking everything ‘natural’ I was allowed to have while I was pregnant (and then breastfeeding once my baby girl was born) but I remember wishing there was more! 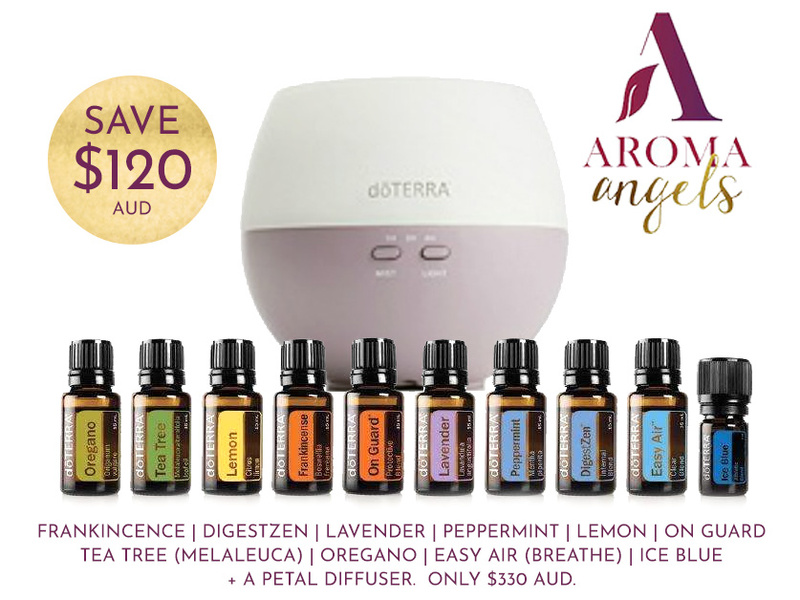 At that time I had no idea essential oils could help assist your health… I thought they were just something you put in an oil burner to make your house smell pretty. What I have now discovered is essential oils are a safe way to help support you and your families health. 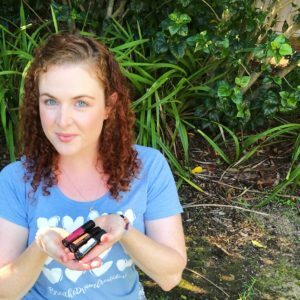 We use essential oils daily to support ourselves physically and emotionally and right now with it being the first day of Winter here in Australia we are using our oils on overdrive to support us with our immunity. Lemon: Purifies the air, detoxes the body, uplifts moods. 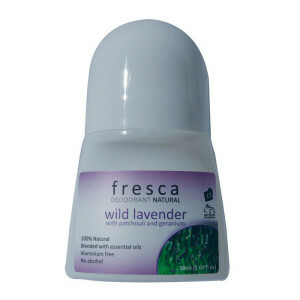 Lavender: Think: all things calming. Incredible added to bathwater, rubbed on the bottom of the feet before bed, soothes headaches. Frankincense: We call this: God In A Bottle! When in doubt, use Frank! Excellent dfor immune & inflammation support. 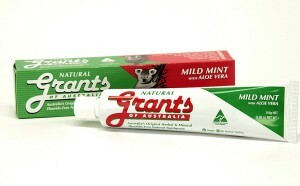 Helps with brain function and improves memory, assists the body in healing cuts, bruises, scars. Apply to fine lines and wrinkles and is a God sent for dry skin. This beauty is worth it’s weight in gold. Oregano: 1 drop daily assists in healthy immune function, high in antioxidants, supports healthy digestion. Tea Tree (Maleluca): Protects against environmental and seasonal threats and can also help to support ear discomfort. Easy Air: Perfect for chest congestion and cold and flu season. Opens up the airways and is fantastic for asthmatics. OnGuard: Protective blend! Scientifically proven to rid cold and flus. Preventative medication. High in antioxidants. Really great to travel with. DoTERRA add OnGuard to their home products, including: toothpaste, hand wash, cleaner concentrate, laundry liquid, etc. Deep Blue: Use topically to ease muscular and joint pain and inflammation plus is also helps ease and sooth creaky knees, hips, lower back discomfort. DigestZen: The name says it all Ease bloating, nausea, heartburn, constipation and digestive discomfort. My favourite way to use this magic oil in a bottle is to apply topically to the belly with a carrier oil. Please contact me via email at aimee@aimeeangelique.com with your questions and book in a complementary 1:1 call as I would love to help support you and your family though Winter. What do I personally use my oils for? In short… EVERYTHING!!! I am proud to say I use them over 30 times a day. Yep that’s right… over 30 times a day! ~ Both Gavin (my partner) and I use them help relieve head/neck/shoulder tension + any aches and pains we have in our bodies. What will you receive if you enrol and start your oils journey with me? 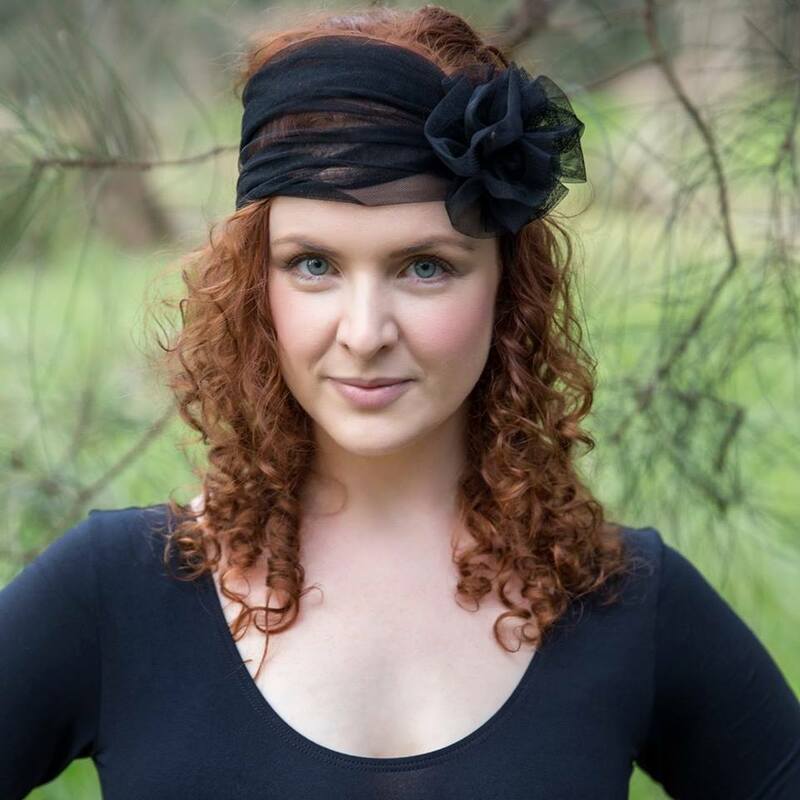 I am a member of a beautiful team called ‘Aroma Angels’ which is a collaborative team of like minded women. ~ Your (FREE) 30-minute wellness consult and welcome call with me (or your enroller). 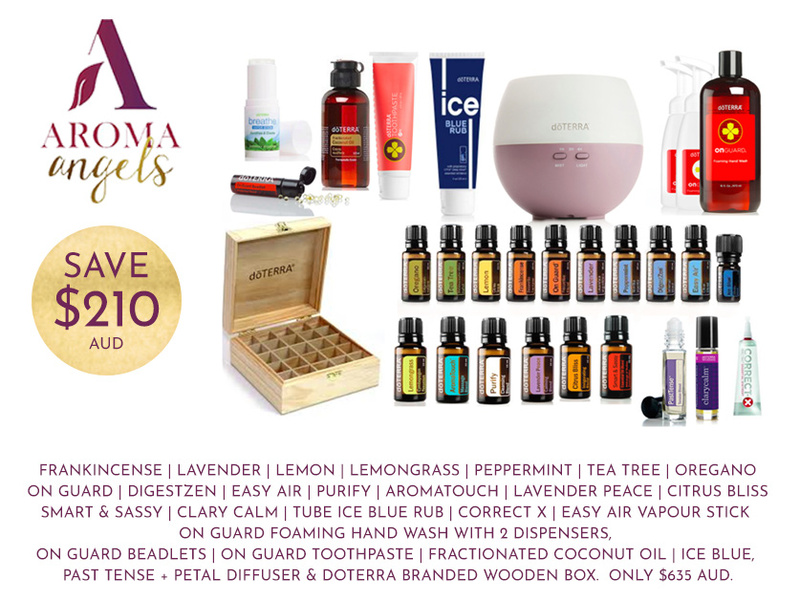 ~ Aroma Angels welcome pack straight to your inbox, while your doTERRA essential oils are on route to your doorstep. ~ Invitations to attend online and in person classes, circles and catch ups to continue learning and loving your essential oils. ~ Exclusive access to private Facebook group with spiritual teachers, health practitioners and essential oils experts guiding your journey. ~ New membership portal coming soon with meditations, recipes, exercises and rituals to work with your new oils. 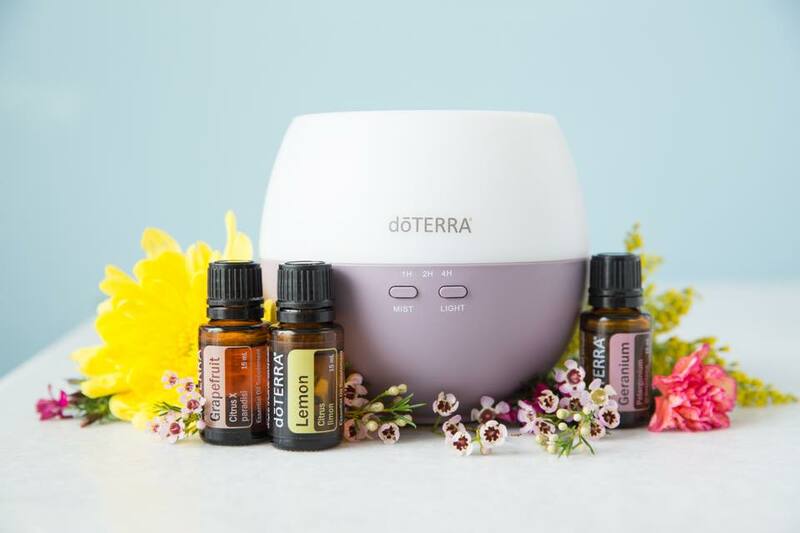 What do I recommend getting started with… I personally recommend getting started with a kit as they are the best value and include the top 10 oils we believe every home needs! The Home Essentials Kits or Nature’s Solution Kits (photos of these two kits below) are my top picks! However there is a kit for every budget. Please remember if you have questions or are keen to jump on the phone with me or would like to catch up in-person for a tea or smoothie please either PM me or hit reply to book in a time. ~ Choose the country and language that’s appropriate for you. ~ Select what kit you’d like to order. If you want to add anything else to your kit, start typing the name of the oil in the box and it will show you. Please note that by enrolling with a kit it waives the $35 enrollment fee (so don’t add that to your cart). ~ Enter your Credit Card details and process your order. Please note: You will hear from me within 24 hours of us seeing your order come through… YAY! Winter is Coming (please read this in a Game of Thrones voice! Haha!) That’s right friends, cold and flu season is bearing down on us and for some families, this means coughs, colds and snotty noses! 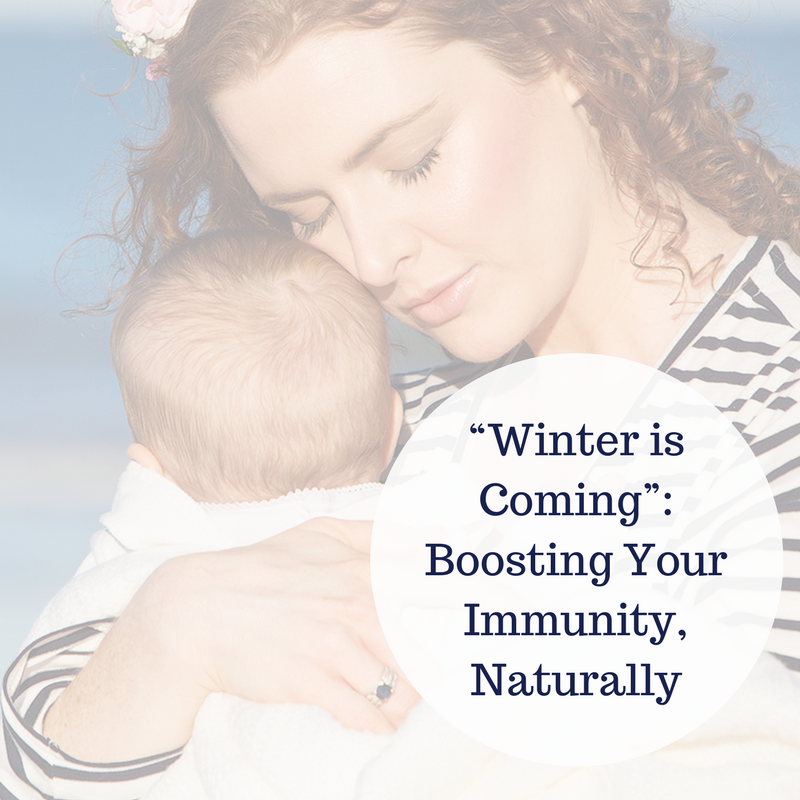 With these tips, here’s to breezing through the winter months without so much as a sniffle! Find yourself a good Naturopath and/or Health Food Store to get assistance in finding the perfect supplements and support for your body. Personally, my Naturopath has recommended that I take a high quality probiotic; Vitamins C & D and a specific immune boosting liquid herbal mixture. Now, each of us is completely different to the next, so it’s important to ensure you receive information based on your specific needs from a trusted practitioner. Having a regular Chiropractic adjustment is so important for my continued health and well-being. Currently, I’m attending fortnightly and it’s made a huge amount of difference to my overall health. Chiropractic adjustments have a range of benefits including reduced stress, increase of white blood cells (key to fighting off infection & disease); improvement to overall immune system function and communication. Rest, rest and rest! Winter is traditionally a slower time in our lives and generally involves a lot more time being spent in the home. Don’t be afraid to embrace this slower pace; go inward, rest, meditate, read your favourite books; enjoy a movie with the family. Our eating habits also change in the cooler months but staying hydrated with at least 2 litres of filtered water each day will help flush out any nasty toxins or funky bugs that are lurking about. It can be harder to keep up the water intake though when it’s cooler, so I try and add in some herbal teas including fresh ginger and lemon. I also love a good chai or chamomile! Crack out the Slow Cooker! Winter is the perfect time to embrace soups, stews and curries and also means we’re keeping up the balanced diet with the inclusion of lots of nice, hearty veg! Steer clear of foods like dairy, sugars and refined foods as they create mucous. Treat your temple! That’s right my friends, make sure you keep loving and nurturing your body. I continue my self-love by maintaining my dry body brushing, tongue scrapping and apply my essential oils topically (as well as using them in my diffuser throughout the house). Haven’t heard of tongue scrapping? Stay tuned, we’ll have something up for you soon. Alternate Nostril Breaths – helps to balance the right and left side of the brain; boosts immunity and clears the sinuses. Child’s Pose – helps relieve bronchial congestion and opens and aligns the body through the chest and back. Cobra – opens up the chest; stimulates the immune system and thymus gland and helps to prevent pneumonia. Legs up the Wall – another immune booster but also helps us to calm the body and re-set your nervous system. Hopefully some of the above tips will help keep you and your family well over this Winter season. Let me know what works for you in the comments below – I’d love to hear from you. Fear and Ego… (My Thoughts and Musings). Is your ego running the show? Something in recent years I have been wanting to create but have continued to allow fear to scare me is I have wanted to film yoga videos. I have kept having the desire to create and bring to life this project but have continued to let my ego hold me back.. 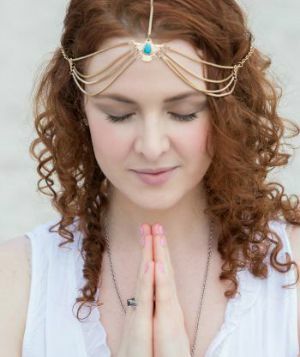 Fear of what others might think (other yoga teachers in particular). Fear of what I will think of myself. Fear that it won’t be good enough. Fear that I will do it wrong. Fear that I will do a bad job. Fear of judgment and criticism. 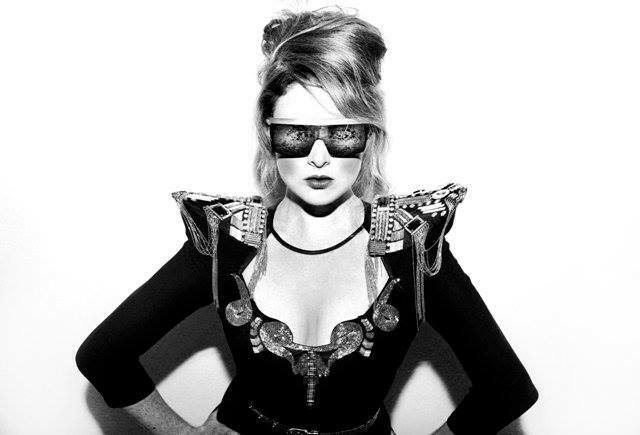 I want to share this with you because I want you to try and give you an understanding of the “ego”… she is very tricky and she tries to hold you back… and even after doing continuous work on myself for over 12 years (yoga, energy healing, holistic health etc etc) my ego still shows up constantly! Fear and Ego try desperately to keep us in our comfort zone but when we make the decision to bravely step outside our comfort zone this is where the real magic happens… we are more open to learn about ourself, we welcome new experiences and doors start to open. I would love to now invite you to do a little exercise… I’d love you to start to think, ponder and journal about what fearful thoughts you are currently having and what are you allowing the ego to hold you back from? What is your fear/ego holding you back from? A new partner? (Starting or ending a relationship). Eating organic produce is extremely important to me and my family. We find that the quality of our fruit and vegetables is so different to that of what you find in the local supermarket. Our produce tastes fresher and I love knowing that what we are consuming isn’t full of chemicals, pesticides and a whole range of nasties! That said, eating organic can be expensive. Really expensive. And when you’re on a budget with a family to feed, it can be really difficult to find the extra dollars to justify buying organic produce. So, with that said, here’s my top tips to help your family to be able to afford the tastes of organic produce, on a budget! Create a veggie patch & grow your own! This has been so much fun for my little girls! Over the last 6 months, Gav and I really committed to creating our own little patch of paradise and growing some vegetables at home. Now when I say Gav and I, what I really mean is Gav (gardening just isn’t really my ‘thing’). Gav and the girls really enjoy this time together each day and I’m happy to help out on the Clean up Crew! Our veggie patch is a modest little garden – there’s no fancy, expensive raised garden beds here. Just a little patch of dirt dug out by hand, some good quality soils, a barrier to keep the pooch out and a little bit of effort and a lot of love. We all have really loved having home-grown, fresh veggies available to us all year round. Not to mention the tiny dent it’s helped make on the grocery bill! My top tip here is to focus on your leafy greens; lettuce, kale, spinach and herbs. They’re easy to grow but expensive to buy and often, we waste so much as we only need a small amount at a time and by the time we go to go back to them, they’ve spoiled and need to be thrown out. Speaking of throwing things out, a big pet hate of ours is food wastage. Apparently, most house-holds waste around 20-30% of food they purchase. Crazy! For so long, we were guilty of buying more than we needed or buying things, changing our dinner plans and letting food go to waste. Nowadays, we try to be more environmentally (and budget!) conscious of what we have available in the pantry, in the fridge and in the freezer before we do our weekly grocery shop. We are also try to meal plan as much as possible to ensure that we know what we’re going to be eating, which saves those last minute runs to the supermarket buying more ingredients and wasting what’s in the bottom of the crisper. We also eat lots of leftovers for lunch and make sure that we’re getting the most we can out of fruit and vege. For some, this is easy! For other meat-loving-carnivores (particularly the man of the house! ), this one can be a bit trickier. Heavy consumption of meat has a significant impact on the environment and when my family does choose to eat meat, we always make sure we allocate a chunk of our food budget to making sure we only buy good quality, grass fed (and grass finished), organic and nitrate free meats. To lower our meat consumption, we often have ‘Meatless Monday’ where we don’t consume any meat at all. We also will often buy cheaper cuts of meat, such as a pork belly or lamb shoulder and pop them in the oven and roast (plus we are investing in a slow cooker very soon!) – much more cost effective and so delicious! Now hands-on-the-heart honesty here, until very, very recently, Gav and I were both pretty much vegetarians. I would occasionally eat meat, when my body called for it and particularly when I’ve been pregnant, but for the most part, I maintained a vegetarian lifestyle. 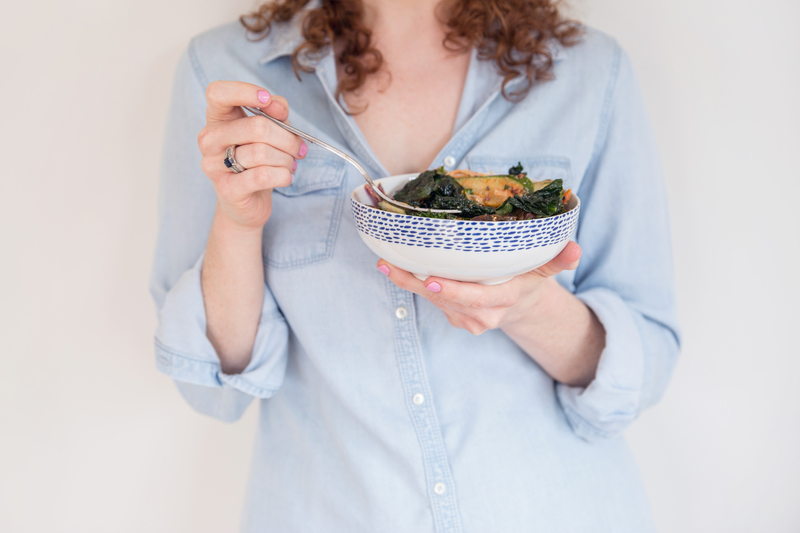 Re-introducing meat to our diet is an important change for our family and we are doing so carefully and consciously – keep an eye out on the Blog as soon I will be sharing the reasons behind this decision and how we’re going about making the change. Some people might not be aware, but we have a fabulous local Food Co-Op! (You can check it out HERE.) Through this Co-Op, I’m able to source great organic, fresh produce and ingredients, at a discounted price driven by people power! This is a great way to ensure I’m able to get my hands on all the ingredients and produce I need on a weekly basis, at a great price and we’re even supporting small local businesses at the same time! Winning! One of the things with modern living, in our big, lit up Major Supermarkets is that you can pretty much source whatever ingredient it is you want, whenever you want. The disadvantages here are that often, these are fruit and veg that aren’t in season here in Australia. This means they’re being imported from overseas and stored for long periods of time. What does this mean for us as a consumer? Well, firstly, the quality is generally pretty poor and expensive to purchase. It also means that this product has a larger environmental footprint in terms of the cost of sourcing and importing this product. So, for this reason, my family shop to the ‘seasons’. Australian Mangos in Summer are a fabulous treat. But in Winter, we choose not to purchase them. Same goes for most of our beautiful fruits. And in Winter time, we choose to follow the Season by buying our winter vege and making up delicious soups and stews! I hope that these tips will help any of my beautiful Yogis who are looking to embrace a more organic lifestyle. Hopefully I’ll see some of you at the Newcastle Farmer’s Market soon! Let me know below if you have any more tips to add, I’d love to hear your thoughts. A personal goal of mine for 2017 is to read more. To find time for myself and take a moment to explore topics that interest me, that challenge me and that encourage me to do and be better. Now for me, reading hasn’t always come easily. I struggled with dyslexia as a child and still to this day, have to put real effort in to my reading practice. BUT I am determined. Reading expands my horizons; it teaches me and allows me to put in to practice newly acquired skills and knowledge. So for me, I am aiming for at least 1 physical book and 1 audiobook per month. If you haven’t found audiobooks yet, get on board my friends! They are so great when travelling in the car; it means I get a lot more ‘reading’ in this way. I also love a good podcast! And again, if you haven’t discovered these either, jump on iTunes and check them out. You’ll be surprised by the wide variety of topics and information out there! So, here’s my wish list for 2017! Let me know below any other recommendations you might have or if you want to celebrate embracing the audiobook! Happy 2017 Yogis! Now, I know it’s officially the 2nd of February today, but for me, I feel like its not until my girls are back in to their normal routine with Pre-School and all our extra-curricular activities that my year has really ‘begun’. Everything after Christmas until our routine kicks back in just feels like an extension of the summer break! Is anyone else the same? So, with the little (and big!) people back to our normal routines, it feels like the right time to take a minute to reflect on all that was 2016 and all that I am manifesting for 2017. Having a job that I love and not being forced to go and work for someone else, doing something that doesn’t light me up! Winning the Violet Gray trip to QLD and going on that little adventure that was a moment, just for me! So, what lies ahead for 2017? I am making some big changes in my world, both personally and professionally. Today, I wanted to share with you my hopes and dreams for the year ahead. I’m putting these intentions in to the universe and seeing what comes back for me. I also love to look back over my manifestations at the years end and see what I was able to achieve; what is still to come and reflect on things that might not longer be important to me going forward. So my beautiful tribe – what is it that you’re thankful from 2016? What changes, goals, dreams and aspirations are you manifesting for 2017? This is something that we covered in my recent Intention Setting Workshop and I’m so proud of my beautiful ladies that came along and kicked off 2017 with a bang! 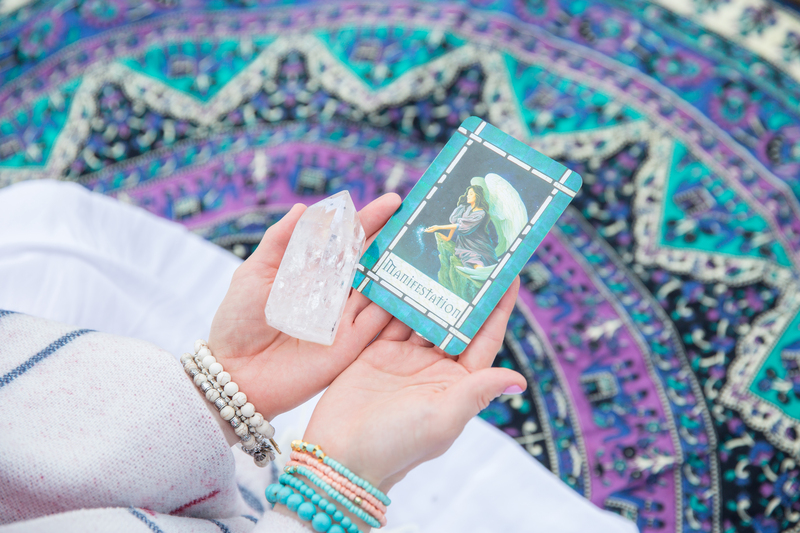 BUT I’d love to hear from you below – putting your intentions and lessons out to universe by writing them down is so cleansing, healing and a powerful reminder of where it is you want to head in your life. Are you struggling to connect with yourself and where you’re heading? Maybe 1:1 coaching might be for you. 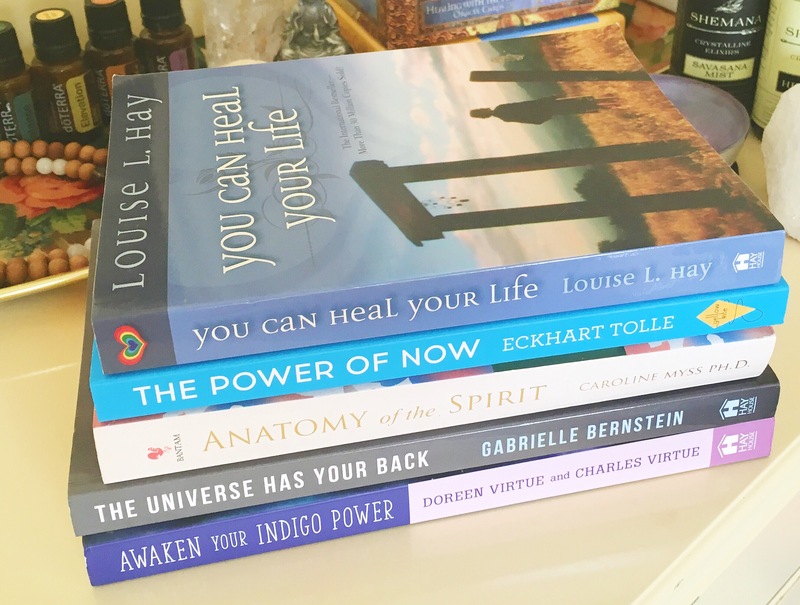 I am so excited to share I have just opened up 6 new coaching spots if you feel called to seek guidance on working through your roadblocks and creating a path to the truer you come and read about my coaching packages HERE. Thanks for reading beautiful and I look forward to connecting with you again in 2017. With Spring breaking through the Winter dreariness, so many of my Yoga students have told me they are raring to get back in to a more regular and structured routine. My best advice to all my students is that your practice doesn’t stop at class. Continuing your practice at home is so important to maintaining and sustaining your health and well-being. 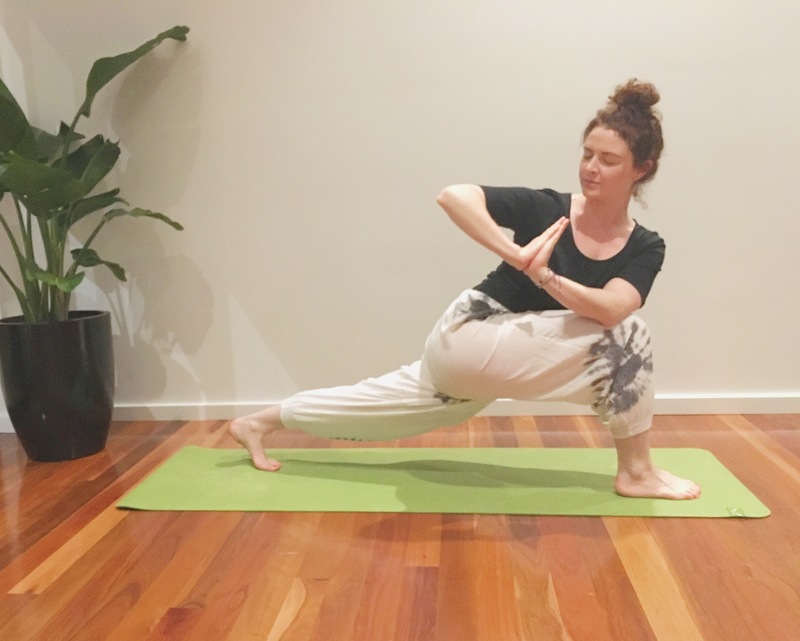 So, with that said, here are my 5 favourite yoga twists that help to detoxify the body (and you can check out my previous posts here on how and why detoxifying is so important for you!). 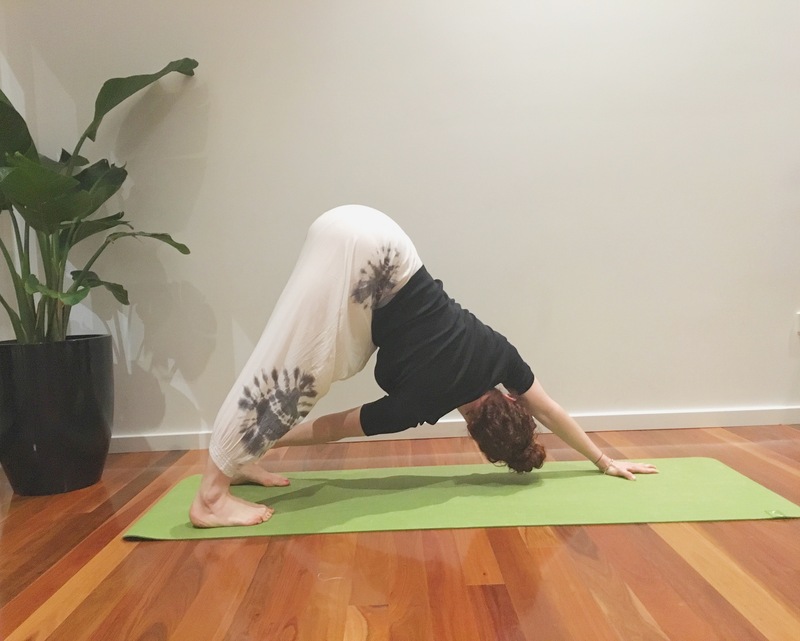 These poses can easily be done at home and if you feel you need any advice or assistance on these poses and the sequence in which they are practiced, please don’t hesitate to grab Gav or myself at the next class, we’d love to help you! Sit on the floor with your legs straight out in front of you. You may like to support your bottom with a booster or a folded blanket. Bend your knees and place both your feet on the floor. Slide your left foot under your right leg, to the outside of your right hip. Lay the outside of the left leg on the floor. Step the right foot over the left leg and stand it on the floor outside your left hip. Your right knee will point directly up to the sky. Exhale and slowly and gently twist toward the inside of the right thigh. Take your right hand and press it against the floor. This should be just behind the right side of your bottom. Then set your left upper arm on the outside of your right thigh near the knee. Pull your front torso and inner right thigh together so they are nice and snug. Actively and consciously, press your inner right foot in to the floor, release the right groin, and lengthen the front torso. Lean the upper torso back slightly, against the shoulder blades, and continue to lengthen your tailbone in to the floor. In this pose, you have two options. 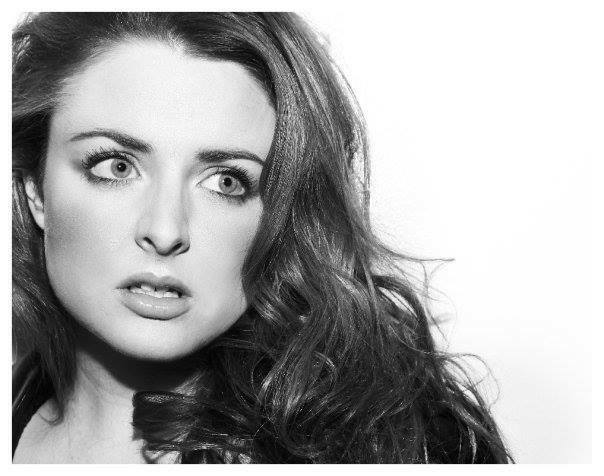 You can turn your head to either the left OR the right. You should continue twisting your torso by turning to the right, or you might even like to counter the twist by turning your torso to the left and looking over your left shoulder, at your right foot. Each time you inhale, lift a little more through the sternum. You may like to push your fingers against the floor to help. With every exhalation, twist a little further and deeper. ** Notes: Breathe through your poses! 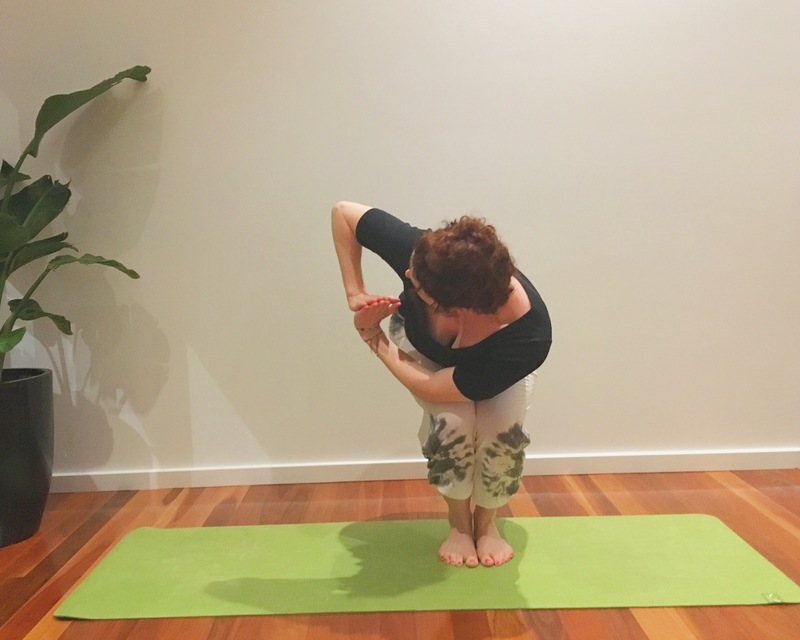 You should start slowly, but aim to hold the pose for between 30 seconds to 1 minute; release from the pose by exhaling. Return to the start position and repeat on the opposite side. 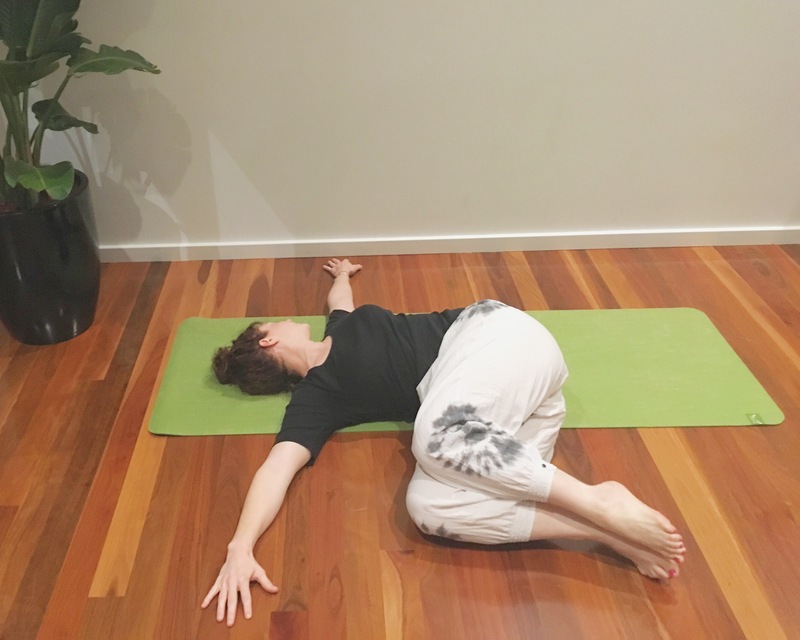 Commence this pose on your hands and knees, taking care to align your wrists directly under your shoulders and your knees directly under your hips. Ensure that the fold of your wrists is running parallel with the top edge of your yoga mat. Also take care that you are pointing your middle fingers directly to the top edge of your mat. Stretch out your elbows, taking care to release and relax your upper back. Press and distribute your weight firmly through your palms and knuckles, spreading your fingers nice and wide. Take care to ensure that you have an even distribution of your weight across both hands. Now, exhale your breath as you tuck your toes and lift your knees off the floor, in one nice fluid movement. Reach your pelvis up toward the sky and then draw your sit bones toward the wall behind you. Gently begin to straighten your legs, but focus on not ‘locking’ your knees. Conjure images of your hips and thighs being pulled backwards from the top of your thighs. Now remember that A! We don’t need to walk the hands and feet closer together, we want to keep that nice A shape and see the extension through your whole body. This my yogi friends is Downward-Facing Dog. Advanced: Work toward placing your left hand on the ground to the outside of your right foot. Beginner: Rest your hand on the outside of your right leg’s shin or upper thigh. Turn your head to look underneath your right arm. Keep your gaze soft. Advanced move: If you have no neck pain, gaze up at the sky. To release from the pose, inhale your breath as you un-twist and return your left hand to the mat. Come back into Downward-Facing Dog. Repeat the pose on the other side for the same amount of time, before finally returning to Downward-Facing Dog again. Start in Lunge Pose with your right leg facing forward. Now, bring your palms together and place at your heart center. With your left knee lifted, push your left heel back and reach the crown of your head forwards to lengthen your side body and your spine. To engage your arms, push your palms together and try to twist in deeper, sending your chest in the direction of the sky and shifting your gaze upwards and over your right shoulder. Extend your left fingertips down to the ground on the outside of your right leg, and reach your right fingertips up to the sky. Stay here for up to 60 seconds. To exit, unwind from the pose, placing your hands down on the mat. Step back to Downward Facing Dog Pose. Repeat with the left leg forwards. Commence in Mountain Pose. Stand with your feet together, with your big toes touching. Beginners may like to stand with their feet a hip-distance apart. Inhale and raise your arms above your head, at a 90 degree angle to the floor. As you bend your knees, exhale and bring your thighs as parallel to the floor as you are able. Your knees will project out slightly over your feet and your torso will form a right angle over your thighs. We know this as Chair Pose. Now, lowering your arms and bring your palms together at your heart centre. Slowly exhaling, twist your torso to the right. Bring your left elbow to the outside of your right thigh. Carefully shift your left hip back slightly, squaring off your hips. Bring your knees in to alignment. Press your upper left arm against your thigh, bringing your right shoulder blade into your back to turn your chest to the right. For a more advanced move, extend both of your arms, reaching your right fingertips to the ceiling and your left fingertips to the mat. You can also place your left hand on a block for assistance. Turn your gaze to the ceiling. If you have your arms extended outwards, you may wish to focus your gaze at your top thumb. Bring your hips down even lower. Lengthen your spine even further on your inhalations and twist even deeper on your exhalations. Stack your top shoulder above your bottom shoulder. Draw your thumbs to your heart, and your heart toward your thumbs. Focus on ensuring you have balanced your weight in your heels, keeping your feet pressing firmly together. Hold the pose for up to 60 seconds. Inhale as you return to your center, reaching both arms overhead in Chair Pose. Straighten your legs, lifting through your arms. Exhale to release back to Mountain Pose. To commence this pose, lie on your back with your knees bent and your feet flat on the floor. You can rest your head on a pillow or blanket. Bring your knees to your chest and wrap your arms around them. 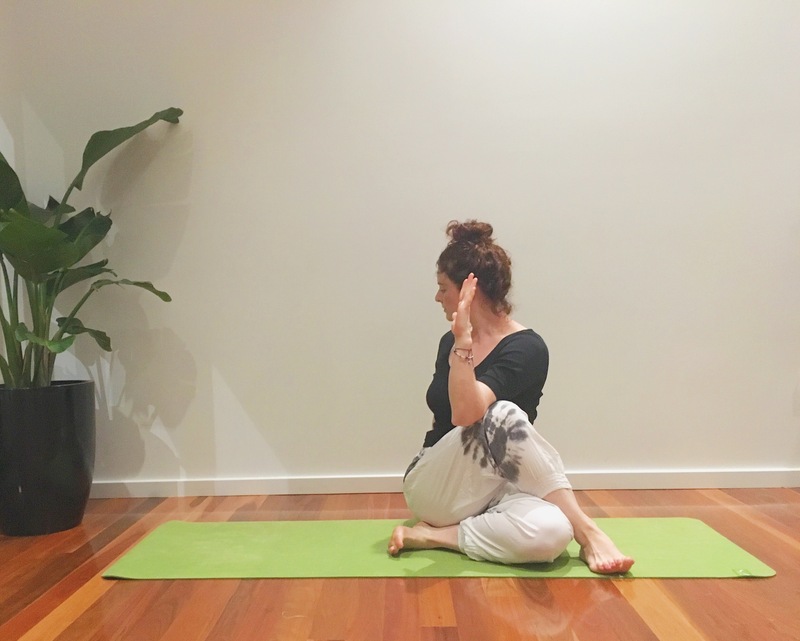 Extend your arms out along the floor at shoulder-height with your palms facing down. Straighten your legs, reaching your heels up toward the ceiling. Align your heels directly over your hips. Keep your knees soft and slightly bent. Draw your low back down, so it is flat on the floor. On an exhalation, lower your legs to the right, twisting your spine and allowing your left hip to lift all the way off the floor. Allow the force of gravity to drop your legs all the way down. Allow your right foot to rest on the floor. Stack the outer edge of your left ankle on top of your right. Work toward bringing your torso and legs into a 90-degree angle, or slightly less. If your legs are angled up toward your right shoulder, you can clasp your left foot’s toes with your right hand’s fingers. Turn your head to the left, bringing your gaze toward your left hand’s fingertips. Keep your shoulder blades pressing down toward the floor and making a conscious effort to keep those shoulders away from your ears. Hold the pose for 10-25 breaths. On an inhalation, slowly come back to your center. Raise your feet straight up to the ceiling. Bend your knees and hug them to your chest. On an exhalation, reach your heels up to the ceiling again. Repeat the above on the opposite side. When you’re finished with the pose, hug your knees to your chest for a few breaths, slowly exhaling and bringing your knees to your chest. Slowly exhale your breath as you extend your legs flat along the floor. I confess ladies; I used to be a product and make-up junkie. I was a marketing company’s dream – I lived and breathed new products, new lines, new colours and gave absolutely no thought to what I was applying to my skin and using in my wash, each and every day. As my path changed and I began to approach my life and health in a more holistic way, I was absolutely shocked at the chemicals and toxins that I was applying to my face and body each and every day. From here, I started making small changes and began switching products. For me, the results have been amazing. My skin is clearer and more vibrant and I feel so good knowing that I have removed products from my life and my body that no longer serve me. Below, I set out my top 6 products that you can make the switch on, today! Best part is, a lot of these products are now being stocked by the big supermarkets, so it’s never been easier to make the switch. Trust me, your body will thank you for it. We all sweat, right?! It’s normal! Completely normal, natural and important; sweat is a major part of the bodies detoxing process. 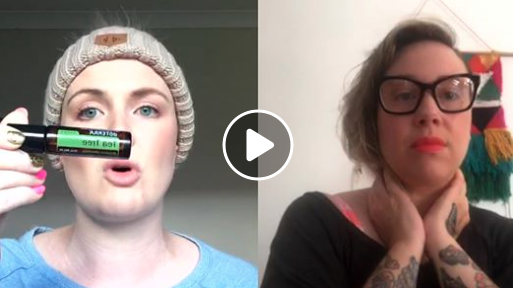 Unfortunately, what isn’t normal is the products that mainstream anti-perspirants, deodorants and body sprays include; parabens, aluminium, propylene glycol, talc and triclosan. These chemicals are absorbed by our body straight in to the underarm, which is directly linked to the body’s lymphatic system. These chemicals also stop the body releasing sweat in the normal manner through our sweat ducts, which in turns slows down and even stops the body releasing the toxins from our system. 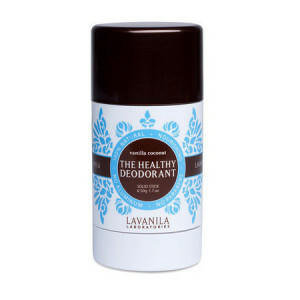 For this reason, I use and recommend making the switch to a more natural deodorant product. And yes, they’ve come a long way, beauty! You won’t be smelling like a dirty old gym sock; there are some really great products on the market these days that stop any BO smell, all without the nasties! You know how I said I was a marketing company’s dream? Perfumes. Oh my. I loved nothing more than indulging in the perfume counter at Myer. Taking home with me a beautiful new, ‘must have’ scent that was the result of a clever marketing campaign with the hottest celebrity peering at me from the counter displays. Huge amounts of money were handed over and my collection grew. But you know what? Perfume is one overpriced product! Did you know that most perfumes / colognes contains only 15 – 30% essential oils for the fragrance and the rest is pure alcohol? 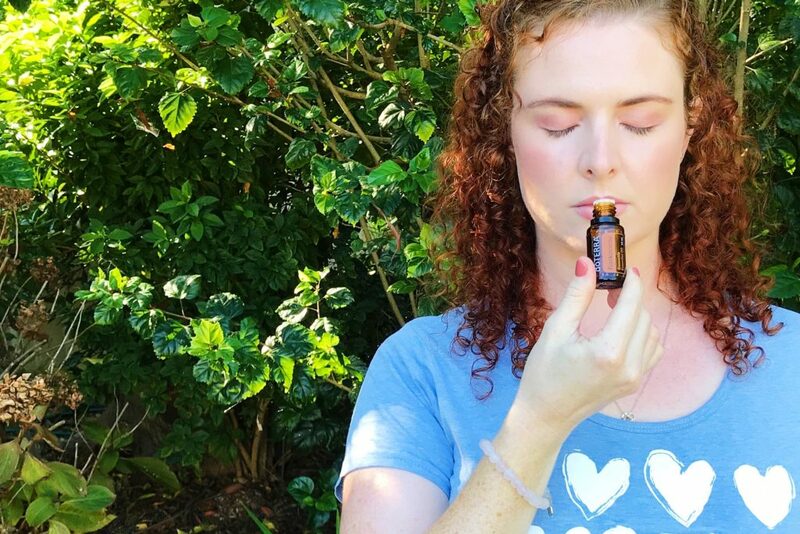 By comparison, making your own perfumes from essential oils means you are applying the fragrance in a more pure form, meaning it will smell nicer on your skin and even last longer! It’s also kinder on the environment and creating a ‘scent’ makes a great personal gift for family and friends. Check back soon for my blog post on how to make your own Essential Oil based perfumes. At least twice a day, 365 days a year we are putting commercial toothpaste in our mouths. Ever read the back of the box? Most commercial toothpastes carry warnings about ingesting the product and also information on how to call a Poison Hotline in case the product is ingested. Scary stuff! Just like a lot of our other ‘everyday’ products, there are a lot of nasties in toothpaste that we would be best to remove from our systems. Yep even those pearly whites can benefit from making the switch! 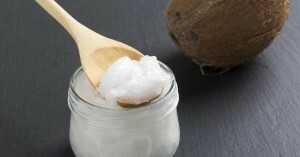 If you haven’t already worked it out, Coconut Oil is the bomb, baby! It’s such a versatile product and something I personally use a tonne of. One of my fave uses for my Coconut Oil is using it as a body moisturiser. Yep, put down that expensive moisturiser bottle that promises you the world but rarely delivers and grab a big bottle of a good quality Coconut Oil and plonk it down in the bathroom instead. The benefits of Coconut Oil are huge but include; helping prevent the skin from moisture loss, rapidly hydrates the skin; helps condition the skin and protect it against UV rays. Best thing is, it’s become super popular and is now readily available in the big supermarkets, chemists and health food stores. This one is specially for my ladies. Not much discussion goes in to this sensitive topic. But stop for a minute and think about it. Pads and tampons are used by women so regularly, for such a long period of time. They are used near and inside our most private, sensitive and complex organs. And yet commercial products that we have been brought up knowing, trusting, are made with synthetic products like polyester and rayon. The cotton used in commercial feminine hygiene products is often grown using pesticides. There is also the environmental factor that we should consider; according to Flow: The Cultural History of Menstruation, the average woman will dispose of approximately 135 kilos worth of tampons in her lifetime. So, for these reasons, I have made the switch and alternate between using a Juju Menstrual Cup and organic Pads and Tampons. I encourage all women to do some research for themselves and also consider making the switch, as soon as possible. Your lady parts will be happier and healthier for it. Laundry detergents and liquids weren’t something I really gave much thought to. I mean, you just buy the one you like the smell of right? Or, if you’re like me, the one that’s on special at the local supermarket; you take it home, wash your 5000 loads of washing that have accumulated in the last few days and life goes on. Trying to keep the dirty clothes basket empty was where most of my thoughts went with regard to laundry! BUT! It wasn’t until I was looking around my home at products I needed to be more conscious of, that I spotted the bottle of laundry liquid lingering up the back of the laundry (behind the pile of washing, it never ends!) My personal online enquiries and research revealed some interesting information including; disclosure of ingredients is not legally required on any cleaning products in Australia or New Zealand; many commercial washing powders & liquids include chemicals like CAPB, SLS, Parabens and Triclosan and the safety of these chemicals is still to be determined; there are in excess of 80,000 chemicals available for commercial use and each year, around 1000 new chemicals are developed. Unfortunately, legislation doesn’t move quite as fast as the scientists and companies developing these new chemicals and often the health concerns of these chemicals aren’t known or disclosed until after the chemical has been included in numerous products. More and more links are being found between some of the aforementioned chemicals, which are available and used in many of our everyday products, and health concerns including allergies, asthma, disruption to hormone and endocrine systems and in some cases, even cancers. On this basis, I made the switch to a more eco-friendly laundry liquid. Let me know what you decide to switch in your home. It doesn’t have to happen all at once – I recommend just replacing one item at a time and transitioning yourself and the family to products that are better for you, your children, your hip pocket & the environment.